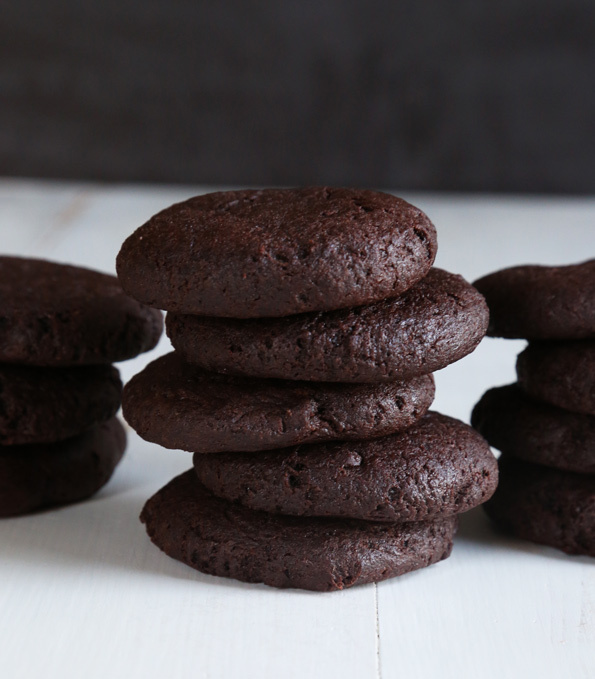 Gluten Free Chocolate Cheesecake Cookies | Great gluten free recipes for every occasion. I’ll be honest—I don’t really like store-bought cake mixes. But I know that they’re still super popular, and I don’t deny that they can seem like a great convenience (I’m convinced their popularity is because the ingredients are measured out with precision, something you can do with that digital kitchen scale I’m dying for you to use!). That’s why I have a whole chapter devoted to make-your-own gluten free cake mixes in my second book, Gluten Free on a Shoestring Quick & Easy. They do make things easier! 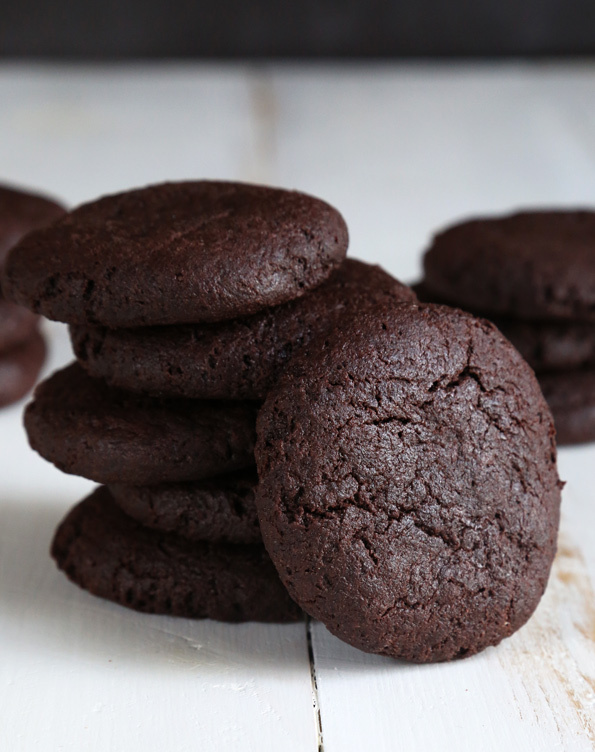 This recipe for gluten free chocolate cheesecake cookies can be made with a store-bought gluten free chocolate cake mix, if that’s your preference (no judgment!). Or they can be made with my Make-Your-Own Gluten Free Chocolate Cake Mix on page 191 of Quick & Easy (reprinted here on the blog, without even telling my publisher, since I want to make sure you can make these super easy cookies toDAY). Oh, and by the way these cookies really do have allllll the taste of chocolate cheesecake, but with the convenience of a neat little cookie. It’s a Christmas Cookie miracle! 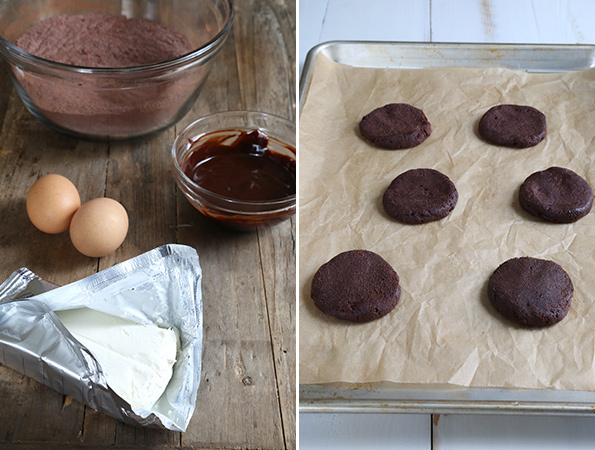 They really are as easy as they look—even if you make your own chocolate cake mix. The hardest thing you’re going to do is, well, not eat the cookie dough before it goes into the oven. These puffy little numbers are deeply rich and chocolatey, but without being at all heavy. Can you taste them yet? They’re a perfect last-minute addition to your Christmas cookie plate, if you’re reading this in December. They’re also the perfect cookie to throw together in 15 minutes flat (really!) when you get a call from friends and family that they’re planning to stop by just because they’re in the area and isn’t that fun! Oh, and if you’re “not really a chocolate person” (who are you? ), try the Cheesecake Cookies from Quick & Easy (reprinted here on the blog). 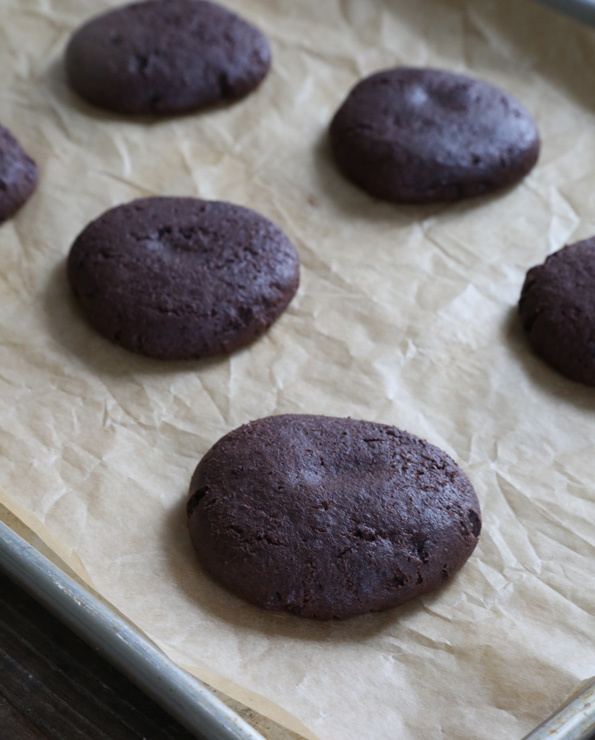 Hey, I bet both recipes together would make an amazing half-and-half cookie, like these half-CCC-half-brownie cookies. Mmmmm…..
Preheat your oven to 350°F. Line a rimmed baking sheet with unbleached parchment paper and set it aside. In a small, heat-safe bowl, place the chopped butter and chopped chocolate. Place over a small saucepan of simmering water, making sure the water doesn’t touch the bowl. Cook, stirring occasionally, until the butter and chocolate are melted and smooth. Remove from the heat and set aside to cool until no longer hot to the touch. Alternatively, melt the butter and chocolate in the microwave in 30-second bursts at 60% power. In a large bowl, place the cake mix, and whisk to break up any lumps. Add the mascarpone or cream cheese, melted butter and chocolate, vanilla, and eggs, mixing well after each addition. The dough will be thick. Drop the dough by rounded tablespoonfuls onto the prepared baking sheet, 1 inch apart. With wet hands, roll each piece of dough into a ball, and then flatten into a disk about 1/2-inch thick. Bake the cookies in the center of the preheated oven for 8 to 10 minutes, or until puffed and beginning to take on a crackled appearance on top. Allow to cool for 10 minutes on the baking sheet before transferring to a wire rack to cool completely. Adapted from the Cheesecake Cookies on page 153 of Gluten-Free on a Shoestring Quick and Easy: 100 Recipes For the Food You Love—Fast! P.S. Don’t forget the Gluten Free on a Shoestring Cookbooks! They make great holiday gifts, and when you buy one it’s a gift of support to me! I made these and they were pretty good, but I do regret using a mix instead of making my own. It was there, I was in a hurry… you know the drill. The pre-made mix made them a little dry/ gritty so I added a little layer of frosting and sprinkles and that did the trick. I’ll definitely make them again but will use Nicole’s recipe for making your own mix. I really want to try these but does the cheese compensate for the sugar. Ariel, a cake mix always has sugar already in it. Please click on the link to see my make-your-own cake mix, to illustrate. these look absolutly to die for. i’m a chocolate fanatic. also, Nicole i made your lean sandwich bread today it barely rose. any suggestions of why it wouldnt rise? I responded to your question the other place you posted it, Elena. Ha, ha. Hate when people stop by unexpectedly! I do not like surprises (except surprise parties–they’re fun). :) I want to bake a bunch of cookies this weekend for my husband to take to work on Monday. Every time he brings in something I make, his co-workers can’t believe it’s GF! I think I’ll add this cookie to the bunch since they’re so quick! Thanks! Perfect! I was just thinking I wanted to make a chocolate cookie for my Christmas cookie plates….now I know which recipe I will try! Will add these to the sugar cookies from your first book. Thanks! Two questions, Nicole: Can these be frozen? and How long will they keep in the fridge? Merry Christmas! Hi, Bonnie, Yes! These can definitely be frozen. They don’t freeze completely solid, so they will defrost rather quickly (and can even be eaten right out of the freezer, in an emergency ;). I actually don’t recommend refrigerating them, as the refrigerator tends to dry out baked goods. I would either keep them sealed at room temperature, or freeze. Merry Christmas to you! One more day of school and we start baking this weekend. I know, Lucy! I just … I don’t get it! I would make these right now if I had the right size cake mix. I have a 15oz Betty Crocker and a 21oz Arrowhead Mills. Maybe I could mix them up, weigh them, and make a double recipe. We need emoticons for you to see just how much we love you! <3 <3 <3 I am doing both the regular and now these. I will try the 1/2 and 1/2 and let you know. It is a gorgeous and it’s nice to have quick and easy options this time of year. But really, who are those people that don’t care for chocolate? WHO? There are a couple people here at my job that do not care for chocolate. I just do not understand it! I use those make your own mixes all the time. They are awesome! These cookies might just go with me to a cookie exchange this weekend. Thanks, Nicole! Now that. THAT’S a cookie. Gorgeous.